I was aware that my husband wouldn't quite be himself when he came out of surgery due to the anesthesia, but I wasn't expecting him to be as funny as he was. At some points, though I tried hard not to, I was laughing hysterically. I just couldn't help myself. He talked continuously. In normal circumstances, he can be a talker, but this was different. This was more of a one-sided conversation, mostly him rambling on to the nurse about any random thing that popped into his head, like how much he loved his wife (aww) and what kind of ice cream he liked. Most of what he said wasn't that unusual, but his dazed, out-of-it demeanor and nonstop pace made it funny and adorable. One of the best moments was when he told the nurse that some people call him Superman, and that I refer to him as Clark Kent. I really don't. In fact, I don't think I've ever called him that. But that made it even funnier. Hmmm...maybe he was expressing some inward desire for me to call him Clark Kent... Hahaha. So, anyway, for the past week, Nathan has been taking it easy at home while his knee gets better, just resting and hanging out with our little baby. After a few days, I guess he started getting restless because he texted me while I was at work and asked what he could do. My response was for him to find a recipe and learn to make something. He doesn't cook all that often, but he'd just recently taught himself—rather successfully, I might add—to make a pretty good steak, so I thought, hey, if I could get him excited to try something else, it would give him something to do and—bonus!—I'd get dinner when I got home that day. Win-win. That afternoon, I got another message from him. He had decided to make a cake. So much for dinner. 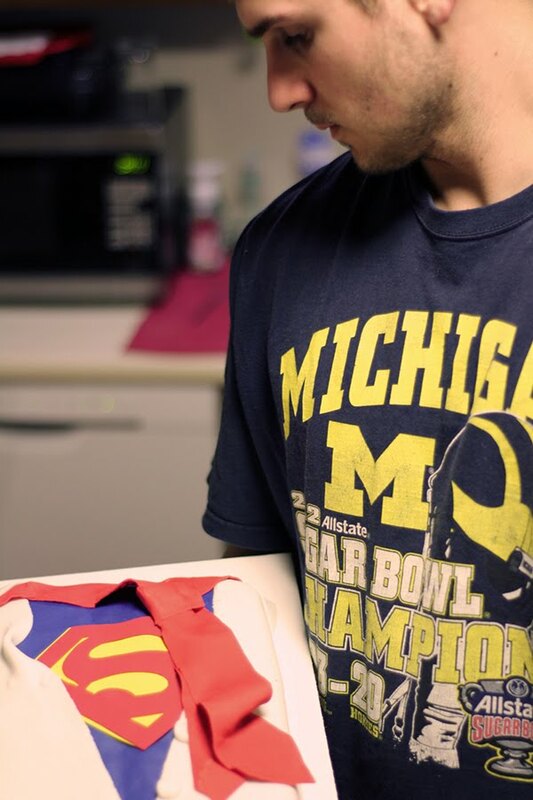 Nathan had never made a cake before. Not only that, but he then sent me a screenshot of what he found online. This. 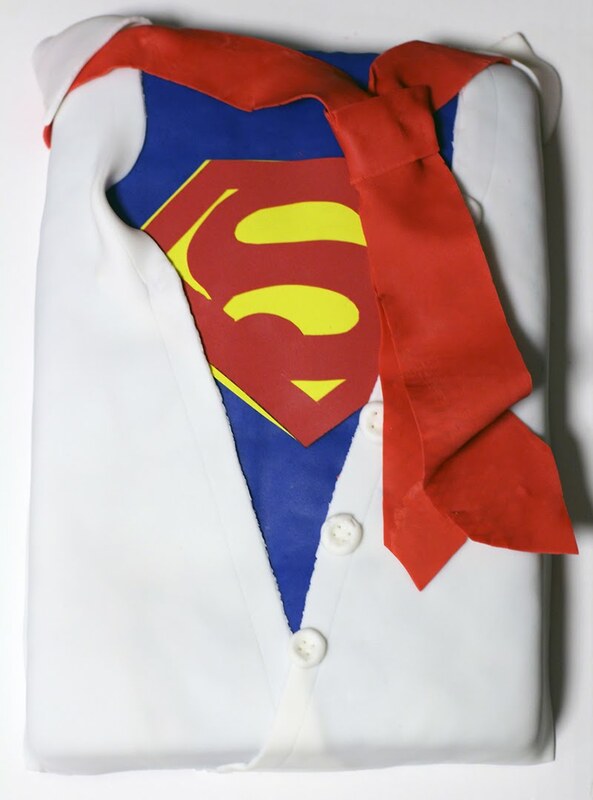 THIS was the cake he wanted to make. Well, the cake he wanted ME to make. A Superman theme, of course. When I got home, I had two layers of chocolate cake, some cans of frosting, various colors of fondant, and an eager husband waiting for me. Now, I am NOT a professional cake decorator by any means. 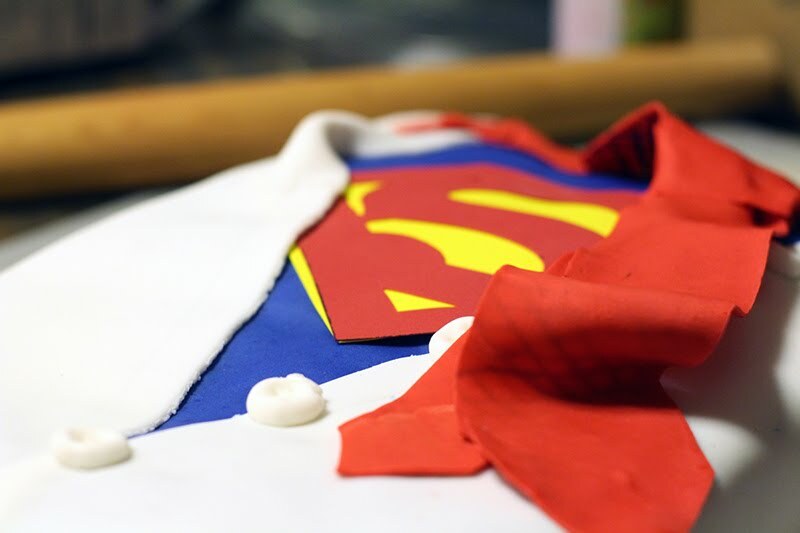 Yes, I've dabbled in cake decorating for birthdays and such, but it was mostly just a lot of improvising with sprinkles and globs of frosting with simple, messy piping. Also, I'd never worked with fondant before. Despite all this, he had complete faith that I could help him pull it off. So we did it together. 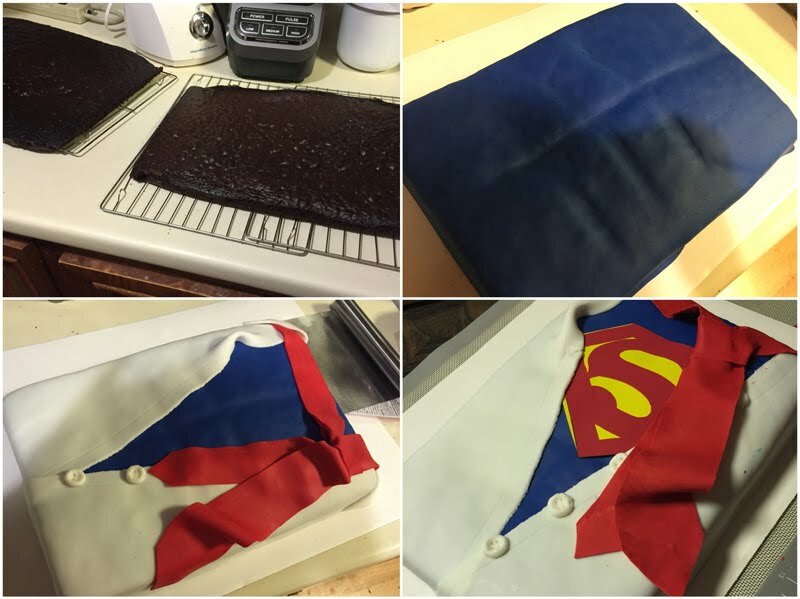 Nathan rolled out sheets of fondant, which I cut, shaped, and placed onto the cake using the photo he had found as reference. I think considering that it was the first time he'd ever baked a cake and my first time working with fondant, it turned out alright. Admittedly, I took the easy route and skipped the elaborate cake carving, and I enlisted my artist sister for the most complicated part of drawing and cutting out the "S" logo from sheets of sugar paper (which I didn't even know existed until now—how cool!). It was a successful team effort. Here's the final product. Not perfect, but not bad! And yummy, too, which is all that really matters in the end, right?